So did anyone besides me hound Twitter all weekend to see all of the Quilt Market happenings. I can't wait for all of the blog wrap-ups. It looked like a wonderful Market and I am super excited for some of the upcoming lines I saw ;) And, I even managed to see a picture of my Lucky Stars quilt hanging in the Moda booth courtesy of the gals at Fat Quarter Shop :) So fun!!! And this quilt totally blew me away. I know, looks pretty basic from far away right?? Your quilt looked fabulous at Market, it was right on one of the heavily-trafficked (is that a word?!?) corners. Ooh, those haunted hice are amazing! Ha ha! 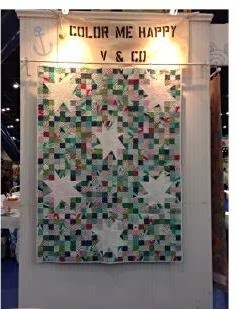 I've been reading everyone's blogs about market like mad - it's almost like being there :-) Love your star quilt too! I love your quilt... it is so beautiful!